So my trusted painter came over on Monday to look at the job and, I thought, give me a cost estimate. Instead he asked me when I was getting all the stuff out of the office so he could start. Seriously? We are talking desk and chair, working table and chair, a tall bookshelf, copy machine on a stand, four file cabinets (two drawer size), a four drawer filing cabinet, two printers, a scanner, a fax machine...well, you get the idea. This move was not going to happen overnight. So I asked him to start in our bedroom instead. I figured trying to get 23 year old wall paper off the walls would entertain him for a while, and I was right. Some unhappy grumbling came out of that room for a few hours on Tuesday. I selected two shades of green for the walls, as we have a chair rail about halfway up the wall, and we went with white for the woodwork to match the rest of the house. Bye, bye cream...and good riddance! While they painted, I spent the week de-cluttering the office. There is still a lot to do before the painters come back on Monday. We are getting rid of the white desk, table and file cabinet that we bought used from a local business 10 or more years ago. Instead we will put a glass topped desk in the smallest bedroom for Jim to have as his office. He spends a lot of time on the computer with his hobby, which is photography. I purchased the program Lightroom for him as a gift and he has really enjoyed enhancing his photographs. It will be nice to get his laptop and monitor off the kitchen counter. Anyway, a few items from my office will be moved into his, such as a couple of the file cabinets and a printer. As for the rest of my stuff? I'm at a loss, but I better figure it out before Monday. I had a bit of a sewing set back. Actually it was a cutting remark that caused all the problems. My 70 different squares of fabric are all cut, so this afternoon I began cutting the purple fabric that will surround each novelty piece of fabric. It readily became clear to me that I did not have enough of the purple fabric to cut into 280 pieces. I quickly gathered up a piece of the purple and one of my squares and dashed off to Jackman's Fabrics, offering up a prayer to the fabric saint that more of the purple remained in the store. I found the proper color on the shelf, eying it with the sinking feeling that there were not 3 yards remaining on the bolt. Once at the counter I had the clerk go over the numbers with me to see how much more fabric was required for my squares. Math is totally not my thing, so to try to calculate the yardage needed to cut 140 5 1/2" x 2 1/2" rectangles plus an additional 140 9 1/2" x 2 1/2" rectangles was a challenge for me. But I thought 3 yards would do it. As the clerk measured my sample square, she said "You do know that your square is 5 3/4" and not 5 1/2", don't you?" Huh? I know I looked at her like she was crazy. I explained that I use a quilting ruler, and I am very accurate with my cuts. She explained that some of the rulers have an extra 1/4" in them. WTH!!! Why would anyone think that was a good idea? At any rate she confirmed that 3 yards would do the trick, and as luck would have it that is exactly what remained on the bolt. Whew, crisis diverted. But when I got home and looked at my ruler, sure enough it has the extra 1/4" on it. So the rest of the afternoon I cut that amount off of each of the 70 squares plus all the purple strips I had already prepared. Like I don't already have enough cutting to do! First I threw the stupid ruler and its three larger sized brothers in the recycle bin. Maybe I should rethink that and throw them in the trash. Or else some poor woman who shops at Goodwill is going to be cussing this old sew and sew! Two years ago when my friend Diane purchased the quilt I had donated to the school auction for her daughter Lauren, she cautioned that she would need quilts for for Tommy and Courtney when they graduated as well. At the time I wasn't sure if she was serious, and anyway Tommy wouldn't graduate until 2011 and that was a long way off. Well, Diane was serious and it is now 2011! Last week the two of us went to Jackman's Fabrics to begin looking at material. Tommy wants a quilt just like Lauren's except that he wants purple as the main color and not Mountain Dew green. So the good news is that I know what pattern I am doing, the bad news is that the quilt has 70 squares of novelty fabric, each representing something of the past or present. That's right - I need 70 different fabrics. We found 26 at Jackman's, as well as three different purples for my borders. I came up with 18 additional fabrics I had a home that will work, leaving me with 26 additional fabrics to locate. I love shopping online as I can enter what I'm looking for, say Harry Potter fabric, and I can usually find something that will work. The trick is to make sure it will look okay with purple! I located the lady I have purchased from in the past, and I'll be able to make up the rest of the squares from her I think. She is looking for a few things I could not find, such as something to represent a trip to Germany/Austria. Castles, perhaps? It will be fun to see what she comes up with. Last time she sent me a whole bag of scrap materials to dig through, and she wouldn't let me pay her anything for them since I was donating the quilt. Last night I cut the 44 pieces of fabric I already have into 5 1/2" squares. Lauren's were only 4 1/2", but Tommy is quite a bit taller than her for one thing. The fabrics we located also have larger patterns on them, so I wanted the extra inch to capture more of the detail. While I am waiting for the other fabrics to arrive I'll begin cutting the purple strips which will border each of the squares. All the cutting is the most time consuming and least rewarding part of quilting, in my opinion. I like seeing all the squares come together as I sew. Oh well, off to the cutting board! Last Thursday we sold our composting company. 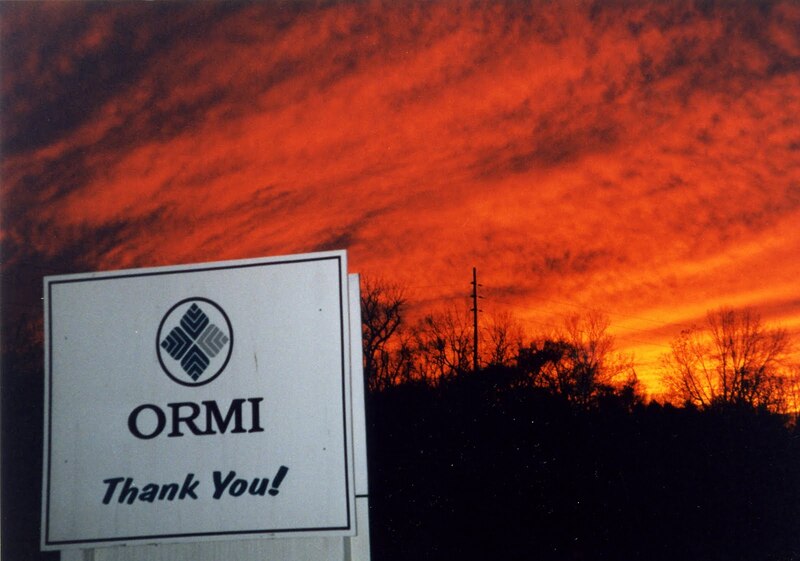 Jim and I started ORMI 20 years ago, following the ban on yard waste in Missouri. We saw a business opportunity as waste haulers, landscape contractors and homeowners would need a place to dispose of their yard waste. I was pregnant with Katie at the time. For a while Jim was the only employee, working out of a shop trailer. I continued to work full time at MOMEDICO and did administrative duties at night and on the weekends. We added a couple of employees and eventually built a nice building on the site. Time passed and we added equipment and additional employees, and Jim built a thriving landscape architecture business. I resigned from MOMEDICO when Katie entered 1st grade, and set up my office out of our home to handle the administrative side of ORMI. We had grown to 9 employees, multiple semi trucks and trailers in addition to the tub grinder and screens, and created a nice market for compost, mulch and soil. But things have changed in this industry. Our state legislature nearly overturned the ban on yard waste last year, which would devastate small composters like us. The down-turn in housing starts means less land clearing waste coming into facilities such as ours. We were concerned about having enough material to supply our customers come the spring. And we are about due to replace the tub grinder, which go for around $750,000. Not good for cash flow. So when we were approached by our main competitor in October about a possible buy out, our ears were open. We signed a letter of intent so that they could look further at our organization, and then they completed their due diligence. Negotiations were made regarding terms and conditions, and we closed the deal on December 30th. Two months from start to finish. Wow! Yesterday Jim met with our employees to tell them the news, and the new owner came and introduced himself as well as some of his key staff. Our employees will all have the opportunity to keep their jobs, should they so desire. This was an important condition for Jim and me. The employees were understandably shocked, as we had given no indication we were looking to sell. Heck, we weren't really looking! But this was the right offer, at the right time, with the right company. When the guys take a step back and separate their emotions from the facts, they will realize that this new company offers them so much more opportunity than Jim and I ever could have done. Things do indeed happen for a reason, and I think this will be a good deal all around for everyone involved. Over the weekend I packed up all the ORMI files in my office and added them to the boxes in the basement (some 20 in all), and they were picked up by the buyer. They will arrange later to get the boxes from 2005 and prior which are stored off-site. We will now take my office and return it to a bedroom once it has been painted, and take the little bedroom we just refinished and put the office in there. This will probably also motivate us to redo our master bedroom since it hasn't been done in (gasp!) 23 years. Then the whole second floor will be in keeping with the rest of the house. As for myself, I plan to initially spend my time finishing dad's book, turning my house research book into an e-book, and doing some research on a book Jim has in mind to write (or have ghost written as the case may be).